나트랑, 베트남의 선 시티 호텔 나트랑 | 호스텔월드에서 예약하세요. 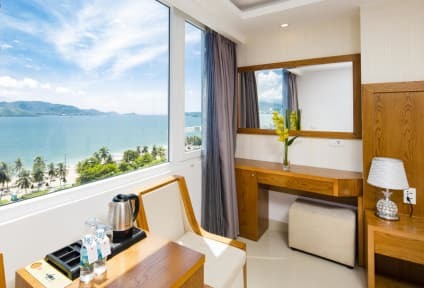 Sun City Hotel is located on Nha Trang Bay, one of the most beautiful bays in the world. Located in the heart of the city, the hotel is 100 metres from the sea (about 2 minutes walk), and 35 kilometres from Cam Ranh Airport. It is surrounded by many restaurants, bars and tourist facilities. The 12-storey hotel will give you a blue ocean view and friendly, hospitable city of Nha Trang. With 37 rooms overlooking to the city and sea, you can unleash your panoramic view of the bay and the beautiful city. In Sun City Hotel, whether on a vacation or business trip, you are always welcomed by our professional, friendly and hospitable team. 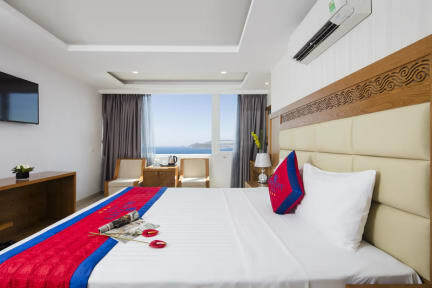 Sun City Hotel consists of 37 rooms with modern equipments such as flat screen TV, air condition, mini-bar, telephone, tea kettle, hot shower , hair dryer.